Science North is developing a tremendous reputation throughout the world, and although she would humbly direct most of the accolades to her colleagues, a young 33 year old lady from Valley East deserves a lot of the credit for the development of this image. For those who have been fortunate enough to meet her, the photo of Andrea Martin, sitting amid a field of flowers is a perfect setting for this wonderful human being who is in touch with life in all of its forms. "Andrea has a beautiful personality. It is easy for people to become enamoured with her and therefore they just simply like to deal with her on all levels," stated her brother Chuck Martin, 31, who is about to receive his Doctorate from the Department of Political Studies at Queen's University. "She has very diverse, eclectic interests which tend to be quite classical. She loves gardening, music, art and anything that is creative and out of the ordinary. Andrea is very much a Renaissance Character. It is this special quality about her that has enabled her to extend her creativity to all of the projects she has ever been involved in, especially with Science North." Officially, Andrea is the Production Co-ordinator and Associate Producer of Science North Enterprises, the corporate exporting arm of Science North. It is because of the efforts of Science North Enterprises that many large multi-national companies and public facilities around the world now have on display special science exhibits and productions. The technology of Science North has been exported around the world, and it is Andrea who is largely responsible for making these projects work. She has been involved in the directing, hiring of talent, and creative design of a number of internationally recognized productions such as 'The Climate Change Show', 'Wings Over The North', and is currently working on a project called the 'History of the Concorde', which will be a permanent display and laser show about he Concorde airplane. She has been all over Canada and the United States as well as to Glascow Scotland, all the while "exporting" Science North technology to the rest of the world. A professional colleague of Andrea's, Matthew Kaplowitz, of Bridge Multimedia in New York City, recently contacted Valley East Today to tell us how impressed he was with this young lady from Valley East. "I find that Andrea Martin has an amazing range of talents and accomplishments. As a project leader at Science North, she's completely immersed in everything from 3D film productions to coordinating six projects at the same time. 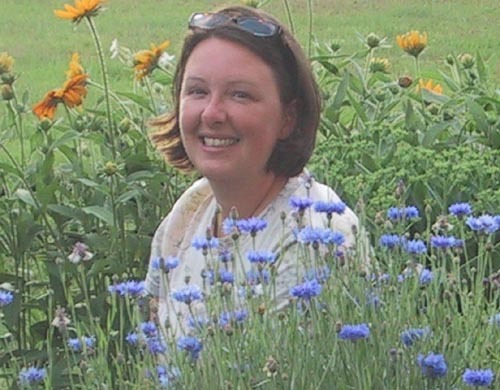 When I found out that she had just earned her 3rd Post-Secondary Degree in Horticulture from the University of Guelph and is now working on becoming a "Master Gardener" with the Sudbury Horticulture Society, it just blew me away." It was Matthew Kaplowitz, from his office in New York City, who was instrumental in helping us arrange to develop this feature on one of Valley East's finest citizens. We thank Matthew for bringing Andrea's accomplishments to our attention. Andrea began her post-secondary studies at Laurentian University in the Geography department. After a year she decided to go to Cambrian where she earned a double diploma in Journalism and Public Relations. That landed her a job in 1994 in the marketing department at Science North. She then was eventually able to secure an internal transfer to Science North Enterprises and has never looked back. "It's not surprising to see that Andrea has such an interest in the environment," Chuck explained when asked about her desire to become a Master Gardener. "Our grandfather, Jack Gauthier was involved in the original re-greening of Sudbury and we've been raised by our parents, Marcel and Catherine, on a large plot of land in the country along Gravel Drive in Hanmer. This "rural fascination" has always been a part of our lives so you could say that where we grew up had a hand in shaping us. We've always had an appreciation for nature and are cognizant of the impact we have on our environment." Chuck related an interesting story about how Andrea ended up with her canine companion, 'Quinte', a 2 year old Vizla. "Andrea wanted to get a dog and she originally thought about getting a pure bred. Then she saw a picture of this "rescued dog" and couldn't resist. The dog came from the Quinte region, so she named him "Quinte". She's like that in many ways. Here was a dog that was desperately in need of human love and compassion. A dog that may have been abandoned for any number of reasons. A dog that needed a person like Andrea." There is no doubt that Andrea will continue to pursue her creative career with Science North Enterprises, impressing everyone she meets in her travels around the world. There is also no doubt that she will be successful in completing the hundreds of volunteer hours and written exams in pursuing her goal of becoming a "Master Gardener". She apparently even hopes one day to run a marathon, and told Matthew that one day she may even decide to take up drum lessons. And so the life of this "Renaissance Lady" continues to unfold, taking unpredictable directions that surprise no one who has had the pleasure of knowing her. When it comes to people who are new to the community, there are two business owners who tend to meet them all. Of course we are referring to Mike Lemieux, who along with his brother, Mag Lemieux, own Hanmer Home Hardware, and Ken Desjardins, owner of Desjardins' Food Basics. "Everyone moving in to a new home or apartment has a need for cleaning and repair supplies as well as start-up groceries," explained Mike Lemieux. 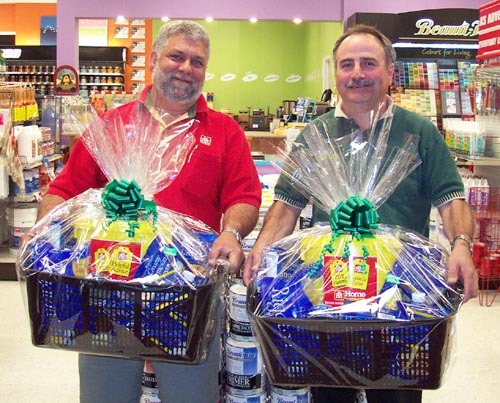 "So Ken and I decided that we would put together a basket of 'goodies' to give as a gift to all newcomers to Valley East as our way of saying 'Thank You for choosing our town' and to give them a hand with settling in." 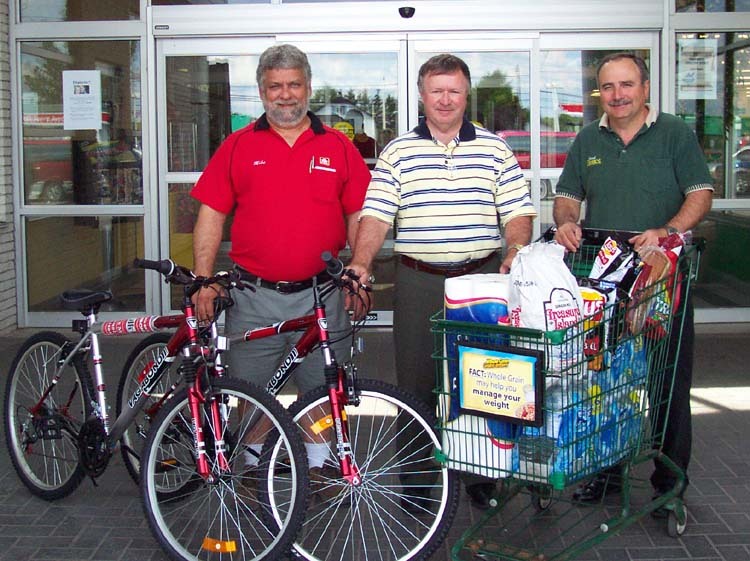 Ken Desjardins owns and operates one of the busiest grocery stores in the entire City of Greater Sudbury, so he has definitely noticed the impact of new home owners in the community. "When it comes to stocking up the shelves after moving into a new home, we know it is expensive. We also know that those first few days are days when you are constantly discovering additional items for your shopping list. The Hanmer Valley Shopping Centre is a great place to come to pick up just about everything you need to make your move complete, so we wanted to say thank you for your support." 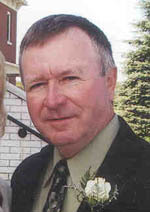 Anyone who has moved into a new home; purchased an older home; or moved into an apartment in the Towns of Valley East or Capreol since July 1, 2006, is encouraged to drop in to see Mike Lemieux at Hanmer Home Hardware in the Hanmer Valley Shopping Centre. He will answer any questions you may have about the community and make sure you receive your gift basket. Several other mall merchants will be adding to the gift basket with items of their own, including Dixie Lee Restaurant which will be providing you with a $25 gift certificate so that you can eat out after your move in. EVERYONE WELCOME! BRING THE WHOLE FAMILY! It is quite likely that one of the most difficult things you will ever have to do in your life is find employment. And if you are a business owner or manager, one of the most challenging aspects of your life will be finding good, dependable employees. 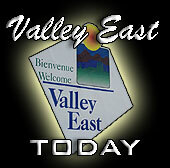 Valley East Today is pleased to provide a special section on the community web site which may help both people looking for work, and people looking for employees. Our employment section has been created so that businesses can post job vacancies, but more importantly, it has a special section for people to post "themselves". In other words, if you are looking for full- or part-time work, you can post the information online for the benefit of employees who may be seeking help. We are providing this FREE service to our readers because we are well aware of the fact that over 80% of all job vacancies are never posted! Therefore, it is a very difficult task for someone who is interested in working to find the vacancies. By creating a "pool of talent" available in the Valley, we are encouraging employers to check out our list first if they are in need of workers. For example, our latest posting is from a mature, reliable woman named Louise who lives in Hanmer. She has a Grade 12 education and has had experience in the grocery store and retail sector. Her goal is to find part-time employment, preferably in the Valley doing grocery store or other retail duties; light house or office cleaning, or house- or pet-sitting. While she would rather work in the Valley, she is willing to travel to Sudbury if necessary. Louise is also available to work pretty much any day and evening of the week. If you are interested in talking to Louise about possible employment you can contact her by email. If you follow the link below, it will take you to the main Employment Site where you can find out more about this service. Once postings are put on the site, whether from an employer or a resident, we will leave it on the site until we are advised to take it off. The publisher of Valley East Today wishes everyone looking for employment the best of luck in finding the type of job that they are looking for. Residents of Valley East and Capreol are advised that applications are now being accepted for positions at the new Canadian Tire Valley East store. Currently the company needs people for set-up and merchandising. Staff and supervisory positions are also available in all retail departments, logistics, cash and the service centre. Auto technicians and installers are also required. An article carried in Valley East Today on July 4, 2006 pointed out that equipment had been taken away from the Valley Acres Playground at the end of May and has not yet been replaced. The following letter was received from one of our readers. My family; Husband and Son, live in the vicinity of Elmview Playground. We absolutely love this playground because it does bring a lot of people together. Mothers and Fathers from all over the Valley will drive their children over to Elmview because they really like it. My husband and I belong to the Elmview Playground Association - trying to make it better and to maintain the Ice in the winter time. My concern is this - Every year the City takes away a piece of playground equipment. So far - 3 (three) play structures have been removed and NOT replaced with something else. It's beginning to get a little bare. The picture on Valley East Today website shows one of the Slides that was taken away. Rumour has it that the City wants to get rid of this Playground???? I am very concerned - the children love it there and so do we. Is there something we can do???? The photo at the left shows the missing equipment that was taken from Elmview Playground. It is obvious that this is not a small piece of equipment and would certainly have provided many hours of enjoyment for neighbourhood children. We can see a piece of plywood seemingly blocking the entrance to the interior of the structure, so it is assumed that there was some malfunction or damage. Nevertheless, the city should have either repaired or replaced the equipment. There is no excuse for simply taking it away. The remaining equipment is full of rust spots and desperately in need of painting. 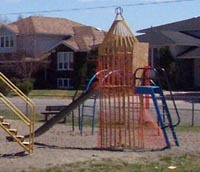 Elmview is one of our best playgrounds. The publisher of Valley East Today shares the concerns of our writer and will see what can be done about it.